The Rev. Fr. Hratch Sargsyan was born in Armavir, Armenia, one of two sons of Simon and Zmroukhd Sargsyan. He was christened Hovhannes, and received his early education in local Armenian schools. In 2000, he felt the calling to become a priest and was admitted to the Vaskenian Theological Seminary in Sevan, where he studied for four years and received a bachelor’s degree in theology. Meanwhile he served as the canon sacrist of Soorp Arakelotz Church adjacent to the seminary, where he was responsible for the care and maintenance of the church and for assisting with services. In 2002, the young Hovhannes was ordained to the rank of acolyte at Holy Etchmiadzin by Archbishop Nerses Bozabalian of blessed memory. Following the completion of the bachelor’s program at the Vaskenian Theological Seminary, Fr. Hratch continued his studies at the Gevorgyan Seminary of Holy Etchmiadzin. During this period, he also worked on preparing radio programs on religious subjects for transmission throughout Armenia. On February 23, 2006, on the Feast of Sts. 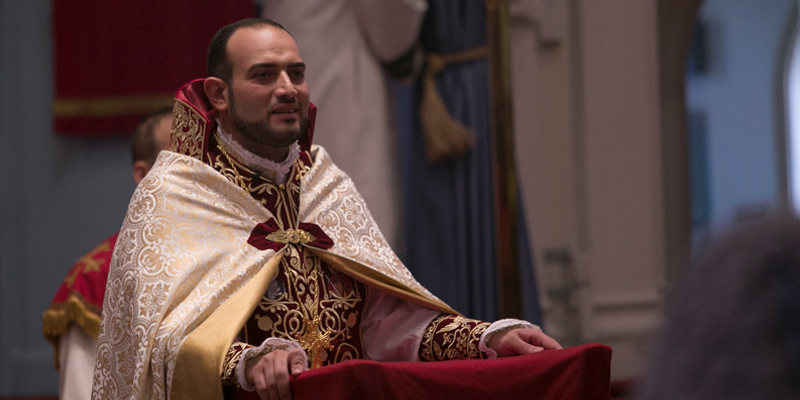 Vartanantz, Archbishop Bozabalian ordained the young acolyte to the diaconate. He graduated from the Gevorgyan Seminary that same year with a master’s degree in theology. At Holy Etchmiadzin, Fr. Hratch was appointed to the position of General Secretary in the Interchurch/Ecumenical Department, where his duties included correspondence and public relations. Parallel to assuming the new position, he took English language courses at the American University of Armenia in Yerevan, and served as a deacon at Yerevan’s Holy Trinity Church. On June 24, 2007, Hovhannes Sargsyan was ordained to the holy priesthood by Archbishop Vicken Aykazian at Holy Etchmiadzin, and given the priestly name “Hratch.” The newly ordained priest began serving at St. Hovhannes Church in Sisyan in southern Armenia. Later he returned to Yerevan to serve as assistant pastor at Holy Trinity Church for one year. In 2008, His Holiness Karekin II, the Supreme Patriarch and Catholicos of All Armenians, assigned Fr. Hratch to serve as an intern in the Eastern Diocese of the Armenian Church of America. At the direction of Archbishop Khajag Barsamian, Primate of the Eastern Diocese, Fr. Hratch became the intern priest at St. John Armenian Church of Southfield, MI. He served the parish for almost two years under the guidance of its pastor, the Rev. Fr. Garabed Kochakian. During this time, Fr. Hratch continued to study English and successfully completed a five-month program in Clinical Pastoral Education at Sinai-Grace Hospital in Detroit, MI. He also made pastoral visits to other parishes in the Eastern Diocese. Upon the completion of his internship, Fr. Hratch became the pastor of St. Sahag Armenian Church in Minneapolis-St. Paul, MN. During the summer of 2011, he was also the assistant director of the Diocesan Summer Camp program. On September 1, 2011, Fr. Hratch became the pastor of St. Gregory of Narek Armenian Church of Richmond Heights, OH. Fr. Hratch is married to Yn. Naira Azatyan. They are the proud parents of two daughters, Tatev and Mane.